Univ Of Minnesota Press, 9781517905835, 240pp. It’s cold in Minnesota, especially around the holidays, and there’s nothing like baking a batch of cookies to warm the kitchen and the heart. 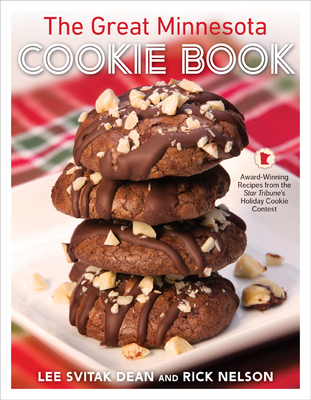 A celebration of the rich traditions, creativity, and taste of the region, The Great Minnesota Cookie Book collects the best-loved recipes and baking lore from fifteen years of the Star Tribune’s popular holiday cookie contest. Drop cookies and cutouts, refrigerator cookies and bars; Swedish shortbread, Viennese wafers, and French–Swiss butter cookies; almond palmiers; chai crescents and taffy treats; snowball clippers, cherry pinwheels, lime coolers, and chocolate-drizzled churros: a dizzying array and all delightful, the recipes in this book recall memories of holidays past and inspire the promise of happy gatherings to come. These are winning cookies in every sense, the best of the best chosen by the contest’s judges, accompanied by beautiful photographs as instructive as they are enticing. A treat for any occasion, whether party, bake sale, or after-school snack, each time- and taste-tested recipe is perfect for starting a tradition of one’s own. Lee Svitak Dean is the longtime food editor at the Star Tribune, where she has guided the Taste section to multiple James Beard Awards, an Emmy, and recognition as “Best Food Section.” She is author of Come One, Come All: Easy Entertaining with Seasonal Menus. Minnesota native Rick Nelson has been writing about restaurants and food at the Star Tribune since 1998. He is a James Beard Award winner and his work has been featured in four editions of the annual Best Food Writing anthology, which highlights the best in American food journalism.